Have the flu? Know when to go. To the ER, that is. Flu-stricken patients are jamming emergency rooms across California and the country. Flu patients feel terrible. But at what point should they head to the hospital? Many visit at the first sign of sniffling. Others wait until there’s no choice. For guidance, we checked in with Dr. Mark Morocco, a supervising emergency physician at Ronald Reagan UCLA Medical Center in Westwood and a clinical professor of emergency medicine in the David Geffen School of Medicine. If somebody thinks they have the flu, when is an emergency room visit justified? Hospital emergency departments don’t turn away patients. Emergency rooms everywhere see and treat patients with the most severe symptoms or life-threatening conditions first. When flu is severe enough to keep you from normal health functions – like breathing comfortably, thinking clearly, eating, drinking fluids and getting to the bathroom – then a visit to the ER is needed. People with chronic conditions should call their doctor for advice at the first sign of illness. What if a patient has been coughing and sneezing for days and having trouble sleeping? Persistent coughing, sneezing, runny nose, sore throat, body aches, fever and headache from head or chest colds or flu-like illnesses can make you feel miserable. If- over-the-counter medications such as Tylenol (acetaminophen) or Motrin or Advil (ibuprofen) reduce your fever and body aches and you are able to drink fluids and urinate normally, you probably don’t need to go to the hospital emergency department. But it’s still best to NOT go to work or school. Cover your mouth with a tissue when you cough or sneeze, and wash your hands before touching or interacting with other people until you feel better – generally, about 5-10 days. The symptoms of greatest concern are persistent vomiting that prevents consumption of water, decreased urination indicating dehydration, high fever that does not respond to over-the-counter medicines, shortness of breath and confusion. Remember that the very young – under age 2 – and those who are over 65, pregnant or with chronic medical conditions have a higher risk and should contact their doctor for advice at the first sign of illness. The same is true for those with compromised immune symptoms, such as cancer or transplant patients. What are my options if I have none of the most severe symptoms? Most people underestimate how bad flu patients can feel – what I call stuck-in-bed bad. But unless you have the symptoms described above, consider contacting your regular doctor first. Any physician can check you out, make sure there is no immediate threat beyond your discomfort, and prescribe medications if appropriate. Most patients do NOT need antibiotics. Over-the-counter medications and plenty of fluids are most helpful. Chicken soup works basically the same as an IV; it is comforting but also easily replaces lost fluids and salt without the needle. Commercially available drinks like Gatorade work, too, but should be diluted to half-strength with water. Stay home until you are fever-free for 24 consecutive hours. That usually takes 5-10 days, although smokers and older patients can feel bad for longer. What should patients and their loves ones be looking for? Symptoms like cough can sometimes linger for weeks. But they are not dangerous unless accompanied by more serious symptoms – difficulty or painful breathing, shortness of breath, confusion, fever that doesn’t improve with over-the-counter medications, or a dry cough that suddenly changes to one that produces large amounts of green or yellow mucus. If this occurs or you suddenly get worse, see your regular doctor immediately or come to the emergency room. 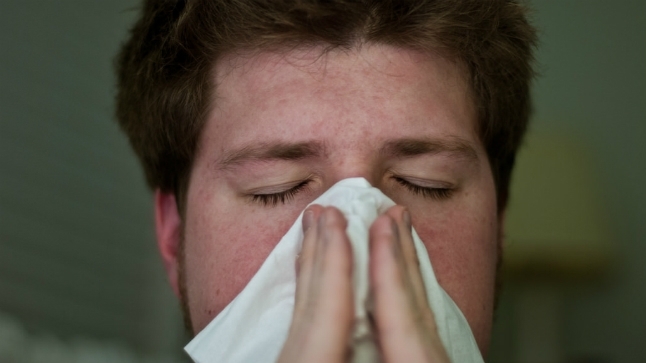 Left untreated, viral illness can become pneumonia. Any tips for staying flu-free? Avoid visiting those who have active flu or illness with fever, and wash your hands or use hand sanitizer if you touch someone who is sick. Flu vaccination is still the most effective way to prevent infection, despite what you may hear on TV. Even a partial-match vaccine might protect you from the worst flu symptoms. The vaccine takes two weeks to kick in, and there could be months left in this year’s flu season, so get one as soon as you can.